For My Lover was published in 2013 to commemorate the Vettriano Retrospective Exhibtion at Kelvingrove Art Gallery. A Retrospective Exhibition which was held at the Kelvingrove Art Gallery. This stunning Limited Edition Artist's Proof Print is now sold out from the publishers and is fast becoming a collectors item. 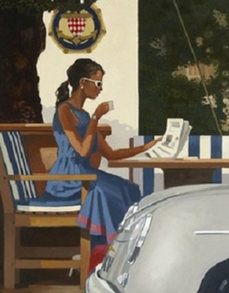 Supplied mounted, ready to frame or alternatively choose the frame option and receive the print in the publishers frame as chosen by Jack Vettriano. This print has been stored flat since new and comes with a Certificate of Authenticity. We also have For My Lover available as as a framed Limited Edition Print.